I’m straight, but I know damn well that Gary Cooper’s beautiful. You can’t miss his beauty in The Wolf Song, a film that places him: lithe, lanky, and naked, by the side of a stream; obscured by blades of grass. Cooper’s outdoorsman, Sam Lash, has decided to wash up. He’s smitten by a girl in Taos, the town where he’s staying, and bathing seems like the right thing to do, since Sam expects to get laid. He will. Not that we see it, mind you; it’s just that Sam’s conquest of beautiful Lola (Lupe Velez) seems inevitable, just like most other happenings in The Wolf Song. Like a lot of late-silents, it’s more a character study than a plot-driven film, deriving its complexity not from what happens, but from how Cooper’s youthful drifter deals with it all. Sam’s a frivolous man, really. We first meet him fleeing the father of a pregnant girl; uninterested in marrying her, unwilling to support her, and most of all, I think, unable to accept domestication. He skips town, soon drawing female attention in a saloon. Nearby, two old trappers, Rube and Gullion, both victims of gravity and the ugly tree, brawl it out for the affections of a dancehall girl. Sam steals her instead. The two old buzzards like his gall, and when, presumably, he’s done with the girl, they set off into the woods together, forming an entertaining trio. Rube and Gullion (Constantine Romanoff and Louis Wolheim) provide most of the comedy in The Wolf Song, and their sunny attitudes make Sam seem grave. 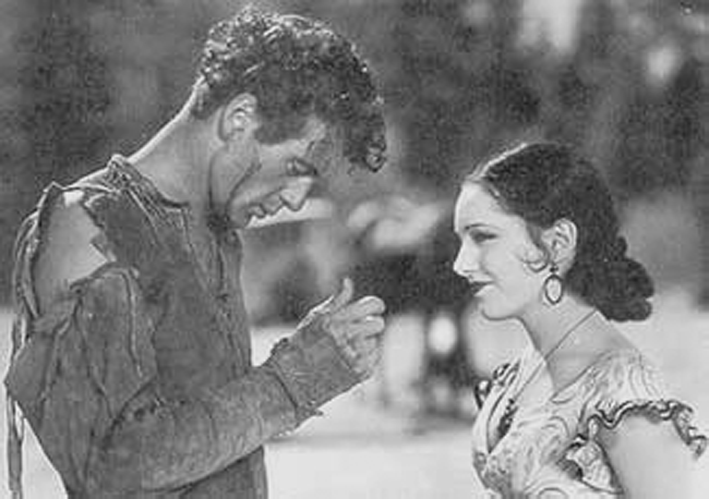 Rube and Gullion just don’t care about most things; if bedding Lupe Velez meant taking a bath and taking up village life for good, they’d probably decline. Not Sam. He gives it a shot. But can he be a good husband to the gorgeous firebrand Lola? Furthermore, does he really care to be? The inner turmoil! That’s why I remember The Wolf Song. Sam acts like the stupidest of frat-boys, but he’s still stoic, still Cooper, and the pleasure of watching him comes with figuring out how self-aware this character can be. Can this young man with the defective moral compass appreciate that he’s doing the wrong thing? Is he righteous enough to see it, much less regret it? Is he bright enough? Something’s happening on that handsome face of his. Even in this early role, Cooper wears the look of perpetual anxiety that would mark his iconic marshal, Will Kane, many years later. For Sam, we wonder what there is to dread—he lives within his means, is healthy and attractive, has won the love (without even trying, seemingly) of the most beautiful woman he’s ever seen—and yet, he radiates gloom, constantly, as though something terrible has already happened, and he’s the only one carrying it around. This is partly the result of some weird chemistry between the leads. Cooper and Velez are so stunning that one’s tempted to accept a warmth between them that isn’t really there—that they would couple seems natural in the way an equation is natural, logical, inevitable (there’s that word again). Yet, despite the length of his…conquests, there remains something puritanical about Sam when Lola’s around. At least one review I’ve read blames this on a cooled, real-life romance between the stars, but to me, it’s simply Gary Cooper, reacting to the phenomenon of this spectacular woman in his arms, rather than to the woman herself. He’s got bigger things on his mind. It could be that, as a new husband, Sam feels trapped. More likely, his anxiety comes not from committing to a woman, but from his realization that, having married a good one, he’s bound to hurt her. The first attitude is self-centred, while the second is selfless, but brings with it terrible guilt. And neither requires Sam to be a deep thinker, an articulate man, or anything more than what he is: a person who pushes forward because he can, guided by Id. This is why a clever plot is not required. Seeing this character work through what must happen (which only must happen because he either can’t or won’t change course) is interesting enough on its own. As for Lola, she remains more of a catalyst for Sam’s suffering than a fully realized human being. Velez’s extraordinary beauty, augmented by some extraordinary dresses (courtesy Edith Head), will either be enough to settle the mountain man, or they won’t, and that’s The Wolf Song’s major issue. Overall, she’s just a spicier version of the very oldest of silent female archetypes: the suffering wife. A star vehicle can be a fine film if the star has enough to him. I think Gary Cooper gives you enough to work with—and ponder over—to make The Wolf Song a movie worth seeing. And I believe you’ll appreciate its rather ambiguous ending, coming as it does after more than sixty minutes of Sam questioning himself and us questioning him. As you witness it, think of Tony Soprano’s frequent lament, when faced with the honourless men of his own era: “What ever happened to Gary Cooper?” Sam Lash, without the benefit of hindsight, can only wonder if he has an honourable man in him. And if he does, is it worth dying for? I saw The Wolf Song at Cinefest 31 in Syracuse, NY: March 18, 2011.